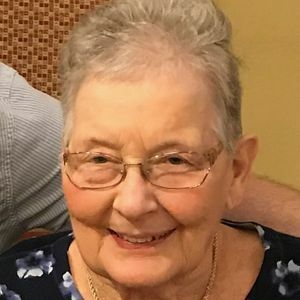 Francoise G. Levesque, 76, of Manchester died April 9, 2019 surrounded by her loving family. Born in Manchester on October 4, 1942, she was the daughter of Bertrand and Bertha (Gagnon) Beaulieu. She was educated in the local parochial school system and graduated from St. Joseph High School for Girls. Prior to retirement, she had been employed as a Worker's Compensation Supervisor with Kemper Insurance Company. Francoise loved to travel with her husband and will be remembered as a friendly, outgoing woman with a strong work ethic. She enjoyed gardening and was an active member of St Peter Parish in Auburn. She was predeceased by her first husband, Philip Pratt in 1998 and her second husband, Raymond Levesque in 2015. She will be remembered as a loving and devoted mother, grandmother and new great-grandmother. Family members include her daughters, Susan Berntsen and husband Michael of Manchester, Christine Biron and husband David of Goffstown; her grandchildren, Jennifer Poirier and husband Ryan of Hooksett, Lauren Berntsen and fiancé Douglas Schack of Hooksett, Andrew and Samantha Biron, both of Goffstown; one great-grandson, Aaron Poirier; one brother, Richard Beaulieu and wife Pierrette of Manchester; one sister, Rachel Paquette and husband Gerry of Nashua; nephews, nieces and cousins. A Mass of Christian burial was celebrated on Saturday, April 13, 2019 in St. Peter Church, Auburn. Committal prayers followed in Mt. Calvary Cemetery Mausoleum. Donations may be made in her memory to the Monastery of the Precious Blood, 700 Bridge St, Manchester, NH 03104. Add your thoughts, prayers or a condolence to Francoise's guestbook.